The excellent south-west wind (Garbí) has ​​been the protagonist in one of the most hard-fought days. This morning has been the first day of the X Puig Vela Clàssica Barcelona. A day where, thanks to the ideal conditions of the wind, the competition has offered unforgettable images and manoeuvres to all the fans of sailing and nautical history. 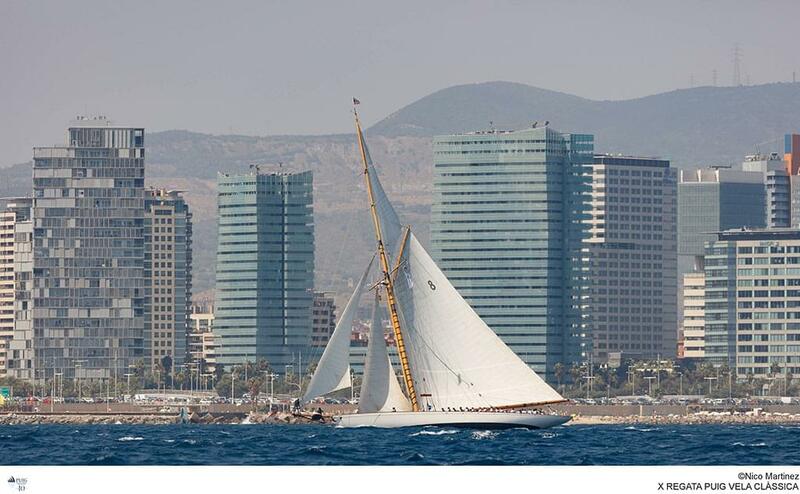 Having these boats in Barcelona is as receiving in the city a race of the Grand Slam of classic sailing. The international elite of this sport is gathered in the Real Club Náutico of Barcelona together with followers coming from all over the world, who pay all their attention to Barcelona during these days of pure marine spirit and tradition. Among the almost one thousand participating sailors, Julia Casanueva, President of the Spanish Sailing Federation, was on board of the Guia, and German Fers Junior, a prestigious naval architect, was among the crew of the Fjord III. The four fleets of Classics, Marconi and Cangreja Époque, and the impressive Big Boats, have been able to enjoy the 17.2 miles of a very technical coastal route, with varied courses that led to changes of sails and very demanding manoeuvres. Leaving promptly at 13 o’clock, the participants have started sailing in front of the Port Olímpic to face a stretch where boats have struggled to distance ones from others, before sailing to El Masnou. From there, they have gone up to Barcelona, ​​passing a buoy in Besòs. The last phase before the finish line included a long stretch of coastline in front of the beaches to the W Hotel and it finished with a short stretch until the arrival in front of Port Olímpic. The south-west wind (Garbí, 200º) has blown with an intensity of 16-18 knots, raising a tide that has grown a little throughout the regatta, but which has not meant a brake to the performance of the boats, especially to those with large lengths. The Moonbeam IV has prevailed over the Big Boats fleet, with a great ability to control the differences with the Cambria, which was ahead, and the Moonbeam III that made it by its stern, after confirming the compensation of times. The Moonbeam III has won the second position, followed by the Cambria. The Xarifa 1927 has completed the classification in fourth place. The Italian Il Moro di Venezia has given no option its his rivals of the Classics 1 category, squeezing the possibilities of the boat and making its tactical decisions. Clear winner in real time, as a result of its larger size, it has also been able to impose itself after the time of compensation. The French Sagittarius and the local Guia, who is defending the title, have maintained a close duel throughout the regatta that has led both of them to complete the podium of the category. In the Classics 2 category, the Alba has firmly initiated the defence of the trophy achieved last year, by clearly dominating after the time of compensation. Again the outcome for the second and third positions has been very close between the Margaritaestalindalamar and the Kanavel, classified in this order. The Marconi Époque, the most numerous with its 17 registrations, has seen the triumph of the Argentinean Cippino, which has sailed for the first time in Europe. This sailboat has also been the first to cut the finish line after a good strategy and successful manoeuvres, and has also imposed itself in time of compensation. The Uruguayan Fjord III has ranked second after clearly outpacing the English Argyl, while the Sonata finished in fourth place. The Cangreja Époque fleet has obtained the best result. The Marigold and the Kelpie of Falmouth have settled their differences for only 18 seconds! After three hours and a half of competition. Without yielding much, the Malabar X has been the third classified after imposing itself to the Marigan without any startle. The performance of the Gipsy has been praiseworthy, and its reduced length has allowed it to complete the race in 4 hours and 42 seconds. This tenth edition means an important milestone for the Gypsy of “Petete” Rubio, who celebrates the 90th anniversary of the boat. It was the only civilian vessel built in the Echevarrieta and Larrinaga (Cadiz) shipyard, which was of eminently military use. During the Civil War it worked like a spy boat for the national side between the capes of Creus and La Nao. Grapeshot marks are still on the sticks as memory of the two times he was shot. “The boat was bought by my family in 1951. They were very fond of sailing and were looking for a stylish sailing boat that would sail well. They saw the Gipsy, they liked it and they decided to buy it”, assures Petete Rubio and adds “it is a singular schooner, with many stories in its deck. We restored it in 1969 and in 2006, preserving in both reforms the two bullets we found embedded in the hull”. 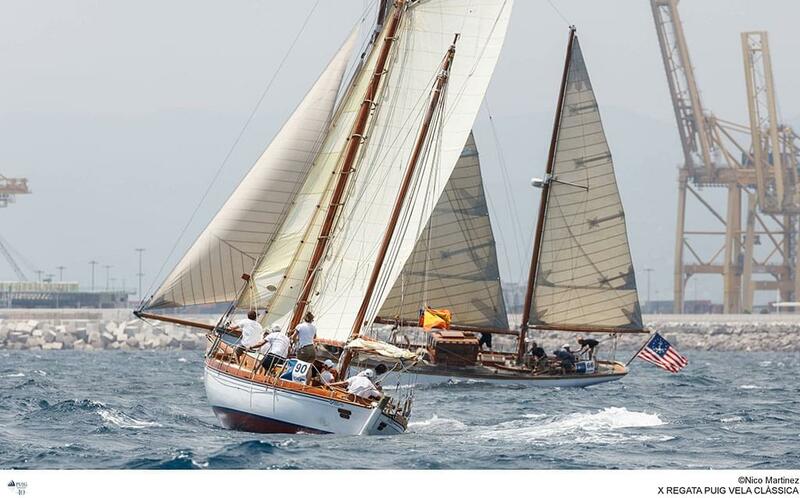 The Gipsy has participated in the ten editions of the Puig Vela Clàssica Barcelona regatta. “Our idea is to take advantage of this regatta to celebrate the Gipsy’s anniversary and, of course, we would like to win this year, it would be the icing on the cake. As a detail of the current event, the organization has awarded the Gypsy the number 90 to join the celebration” says Petete.